SAR 19B Class 4-8-2s Nos. 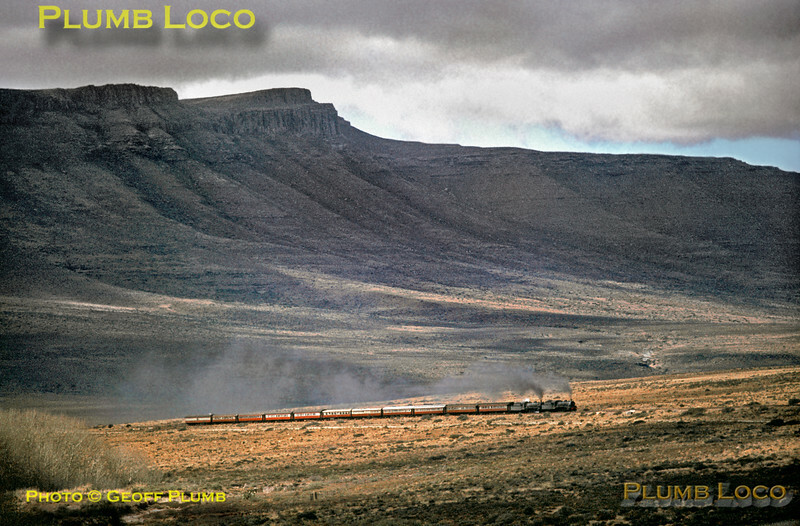 1404 & 1405 and their 11 coach train are completely dwarfed by the dramatic scenery and sky, fortuitously lit by a shaft of sunlight, as they battle their way to the summit of the Lootsberg Pass with the "Mossel Bay Express", between Graaff-Reinet and Middelburg on Friday 1st September 1972. The mountains are part of the Sneeuberg massif, rising to 8215 feet above sea level. Slide No. 9663.